The fastest way to tell the world about your innovations, research, products and services. Time for any business is a precious commodity, and we know that is, even more, the case with busy Life Science and Biotech companies who need to focus on research, development, growing their customer base and attending industry events. That being the case, promoting your business across social media and email marketing can seem like a daunting task – something else to keep up-to-date, another task for your busy marketing team or marketing individual. To promote your Life Science or Biotech business across selected social media channels does take a chunk of time. Social media channels are busy spaces, and if you are not posting regularly, you aren't getting any visibility. If your competitors are keeping their customers informed on Twitter, LinkedIn, YouTube or Facebook, they are doing this because it is giving them a return on their investment. You need high-growth. The dominant big companies may have a team of marketers tasked with doing this for their organisation; you may not have that luxury. If you could post as effectively as the big players that could very well give you the competitive edge you need. Especially if you are in the highly competitive life science or biotech eCommerce space. Believe me, they are! Okay, they may not be on social media during their work day, they will be in their personal time. Many of the large Life Science organisations and academic bodies have very active social media conversations. They wouldn't spend time and resources on this activity if it wasn't providing ROI. A series of 'decision points' includes Google searches and social media research. If you don't have a regular presence in the right places, your brand and voice are not going to be seen. This is where CoSchedule is your best friend. Helping you to refine your social media and email marketing process and strategy. Giving you greater visibility will less effort. Organise your news, social and email promotion from one place. Whether you are a marketing team of one or many, CoSchedule helps you to eliminate multiple communications, scattered or random planning and free's you so you can focus on the more creative tasks of writing leading life science content and growing your audience. CoSchedule allows you to sync all of the tools you use to create Life Science content and the social media and email platforms that are special to your sector. You know where your audiences chat and communicate with their peers, you can have a substantial presence with reduced effort. CoSchedule easily integrates with WordPress, Google Analytics, Evernote, Google Docs, Mailchimp, Active Campaign, Zapier and many more widely used marketing software. Promote like a team of social media experts. Discover the best times to post and how often. Each social media platform has its nuances, knowing when to post and how often can be challenging. Remove this guesswork with Best Time Scheduling which spaces out your messages for maximum coverage on each social media channel you choose. Having to manually fill your social media channels with content is time-consuming and (to be honest) a little tedious. You can set up dozens of social messages in bulk, at a time that suits your busy schedule. Creating a predefined social sharing plan that you can reuse as often as you need. Giving you back the time to create the white-papers, authority reports and customer guides your business needs. How do you know what is working, which aspects of your social media activity are driving traffic and getting you noticed by the right people? 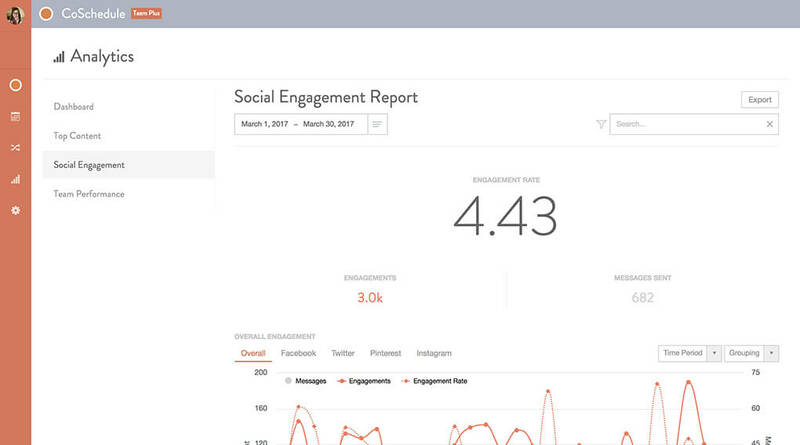 With CoSchedule you detailed analytics for each platform, showing you your most popular content. This means you can re-use your best content with ReQueue which keeps you visible and fills the gaps in your calendar. Sharing and curating industry content is great for your brand. Sharing industry thoughts and trends gives your followers extra information and provides you with more to say. CoSchedule provides a handy Chrome extension. Add this to your Chrome browser and you can post industry news or partner content directly from the browser, adding the content to your CoSchedule calendar with out you having to login to your dashboard. This is a speedy way to share leading news. An attention-grabbing headline makes the difference between an article being read or not. CoSchedule has a built-in headline analyser to help you refine your headline for higher impact. People reach the headline first, much like a newspaper on a news stand and in the hectic online world if your headline isn't attracting attention then you won't be seen. We use WordPress for our business blog (affectionately called The Lab). WordPress is the worlds most popular Content Management System. At least 30% of the web uses WordPress as the platform for their website. To make your life even easier, you can set up a sharing schedule straight after writing your article or blog post. Right in the WordPress dashboard. Getting my content out to my audience is really important to my business. I'm a creative designer, so creating content and graphic design is a pleasure, posting on social media, for me, is not a compelling process. That being the case, if I can use a tool to take that load from me and free my time to do the things I love then I'm going to grab it with both hands! I love CoSchedule, it saves me so much time and provides me with an exponentially large social media presence in relation to my business size and team. I've created a short video of me in action with my CoSchedule and how it helps me to spread my business message and showcase our expertise. Yes, I show-up and engage on my social media channels in real-time, however, I know these channels are really busy and I can't be there all of the time. I have websites to build, UX to design, SEO strategy to refine and clients to support. I know your life science business would benefit from more exposure and be able to reach the widest audience possible. Reaching across the globe, time-zones and continents. Modern marketing requires new tactics that are tailored to your audience. A softer sell that provides information and guidance rather than a hard sell. This softer sell is with valuable content on your website, content that informs and inspires your visitors your with innovation and insight. If you create it they will not automatically visit. You need to reach out to your audience in this busy online world in the most efficient way possible. Using the best tools available will help you punch above your weight. CoSchedule could save you a massive amount of time and increase your reach. Levelling the field when competing with the larger players. Visit CoSchedule and find out how they can help you with your promotional campaigns. Or, we are here to help you. We provide a 'done-for-you' content creation service especially for life science and highly technical niche sectors. Being specialists in your sector enables us to rapidly understand your unique needs enabling us deliver powerful results quickly. Saving you time, stress and money and delivering the best ROI. Belinda White, Website Consultant, Digital Strategist and award winning Designer with over 25 years’ experience of developing and creating successful brand, print and digital campaigns for her clients. Belinda knows upcoming industry trends, best practices and a talent for interpreting her client’s businesses, both on and off-line. Past creative industry experience includes working on creative projects for BP, Shell, P&G, Marks & Spencer, Nike, WH Smiths, Master Foods, Co-op, Argos and Sage to name a few. Expert in Life Science Web Design and Digital Consulting. Crafting all aspects of print design, branding development, front-end web development, user experience design, search engine optimisation, email marketing campaigns and 10x content creation.